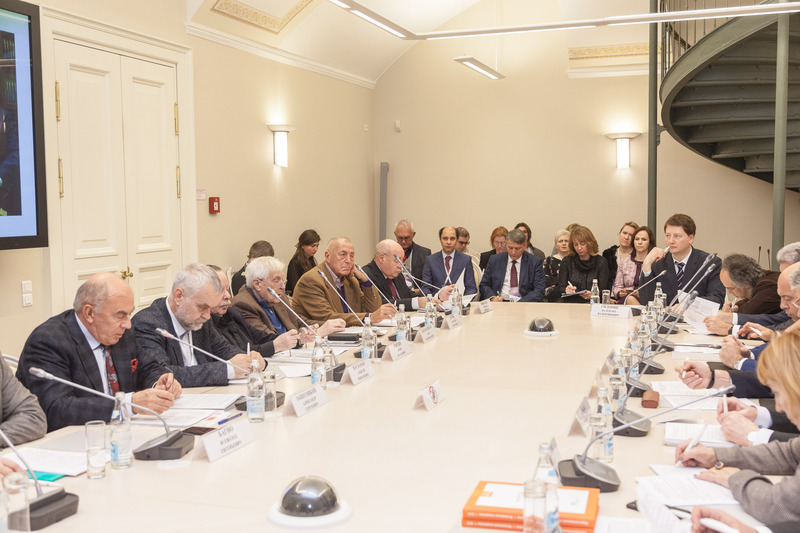 A meeting of the Organizing Committee for the Year of Granin was held at the Presidential Library within the framework of the VII St. Petersburg International Cultural Forum. 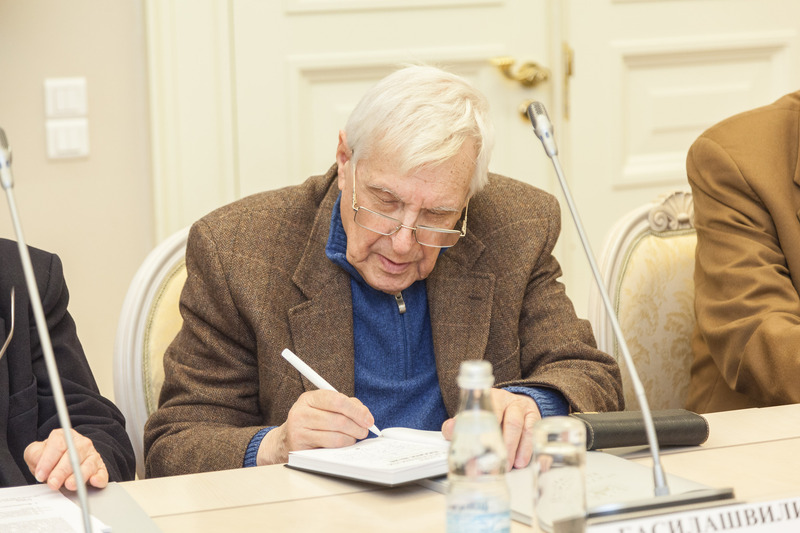 At the meeting, under the leadership of the President of the Russian Book Union, Sergei Stepashin, they discussed the plan of the main events to perpetuate the memory, prepare and hold celebrations of the centenary anniversary of the birth of Daniil Granin (1919–2017) in 2019. Acting Director General of the Presidential Library Valentin Sidorin said that the writer had visited the Senate, 3 many times. 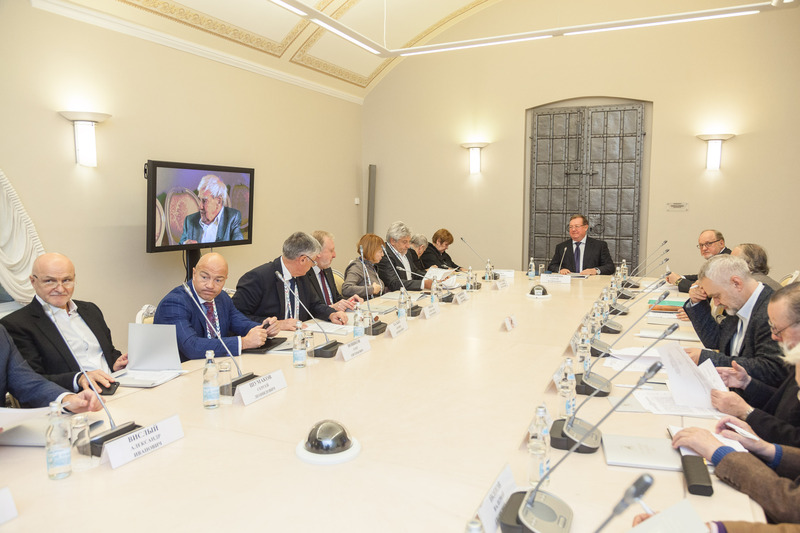 Moreover, in the hall of the Academic Council, where the current meeting was held, five years ago they made a film - an interview with Daniil Granin. Now it is available on the Presidential Library’s portal. In the film, the writer and public figure tells about the past years, paying special attention to the wartime, to which many of his literary works are also devoted. 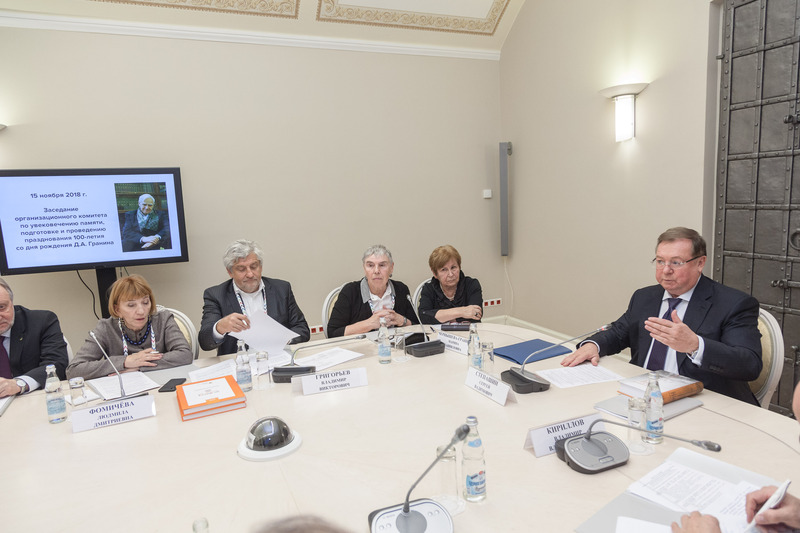 Valentin Sidorin spoke about a large project dedicated to the memory of Daniil Granin, which the Presidential Library implements in conjunction with the St. Petersburg Humanitarian University of Trade Unions (SPbGUP) and the writer's relatives. 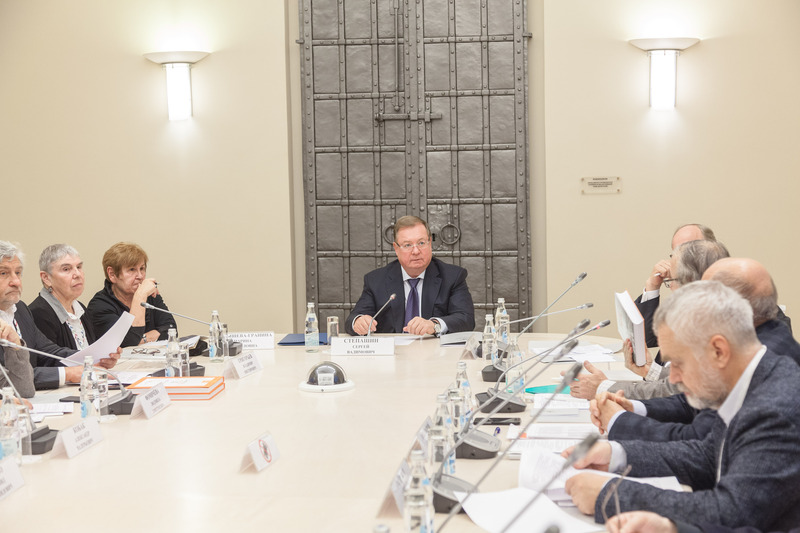 December 11, 2018, the Presidential Library will host a video lecture of “Knowledge of Russia” cycle on “Granin and the Youth”, which inter alia, will be attended by Rector of SPbGUP Alexander Zapesotsky, and via video conferencing mode representatives of several St. Petersburg universities will participate in the discussion. universities and schools, as well as students of St. Petersburg State Unitary Enterprise from different cities of Russia and CIS countries. The video lecture will be broadcasted live on the Presidential Library’s portal and in the official group of the institution in the VKontakte social network. On the same day, it is planned to open a multimedia photo exhibition based on the St. Petersburg State Unitary Enterprise dedicated to the centenary anniversary of the birth of Daniil Granin. The third point of the program of joint activities with the university will be the signing of cooperation agreement between the Presidential Library and SPbGUP. Valentin Sidorin also asked the attendees to support the creation at the site of the Presidential Library’s electronic collection of a large collection dedicated to the life and work of Daniil Granin, including, of course, the writer's archive, converted into a “digit”. 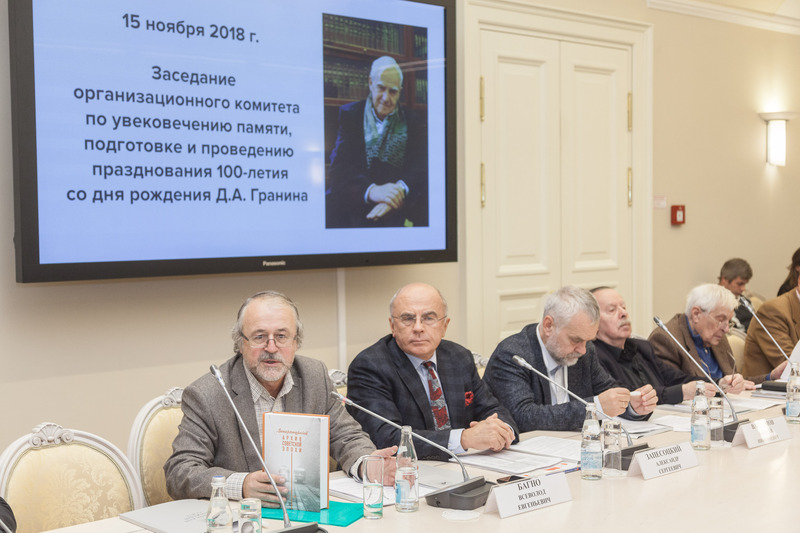 The chairman of the organizing committee to celebrate the centenary birthday of the writer, the President of the Russian Book Union, Sergei Stepashin, fully supported this proposal. The head of the Presidential Library emphasized that all the events being implemented are intended to represent Granin not only as a writer, a patriot, but also as a thinker, a major public figure who always had his own point of view on many events and defended it. It is on such a person, according to acting Director-General of the Presidential Library, modern youth should be equal to. “Every day we hold video lectures and educational lessons in the Presidential Library, thanks to which schoolchildren and students become familiar with the history of our country”, - added Valentin Sidorin. “Next year we will give a lesson dedicated to the 75th anniversary of the complete liberation of Leningrad from the fascist blockade. We have plans to make the basis of our lessons the works of Daniil Granin, his military memories”. Finally, an agreement was reached that next year the Presidential Library will become one of the venues for holding events in the framework of the Year of Granin. The daughter of the writer Marina Chernysheva-Granina told about the latest achievements of the Granin Foundation she headed. So, we managed to publish a book of memoirs of Daniil Granin, work on the collection of his works beagn, the first two volumes are ready. Work is continuing on an exhibition on the history of the creation of the “Blockade Book” (available in the electronic reading room of the Presidential Library). It was also suggested that the work of the great native of Petersburg should be more actively promoted abroad. The leadership of the Russian Book Union supported relevant actions at the Frankfurt Book Fair and the Paris Book Fair. The Vice-Governor of St. Petersburg, Vladimir Kirillov, spoke about the decision already taken to name after Daniil Granin a Square near the Likhachev Foundation in the Central District of the city. The grand opening of a memorial plaque on the house № 8 on Malaya Posadskaya street, where the famous writer lived, is scheduled. The question of the Granin’s monument is still in the process of elaboration. According to the People’s Artist of the USSR and Oleg Basilashvili, Daniil Alexandrovich’s friend, who attended the meeting, one must be extremely careful when choosing a sculptor and a sketch of a monument. Vladimir Grigoriev, Deputy Head of the Federal Agency for the Press and Mass Communications of Russia, suggested that an electronic photo exhibition dedicated to Daniel Granin be modeled so that it could be shown in different places, including in every Russian center of science and culture abroad. Deputy Minister of Culture of Russia Alla Manilova noted that a competition for a monument to the writer would be held. And “there will be no problems with the means to create films about Granin”. Within the framework of the competitions of the Ministry of Culture to support young theater directors and playwrights, beginner talents will be invited to stage several performances based on the works of Daniil Alexandrovich. 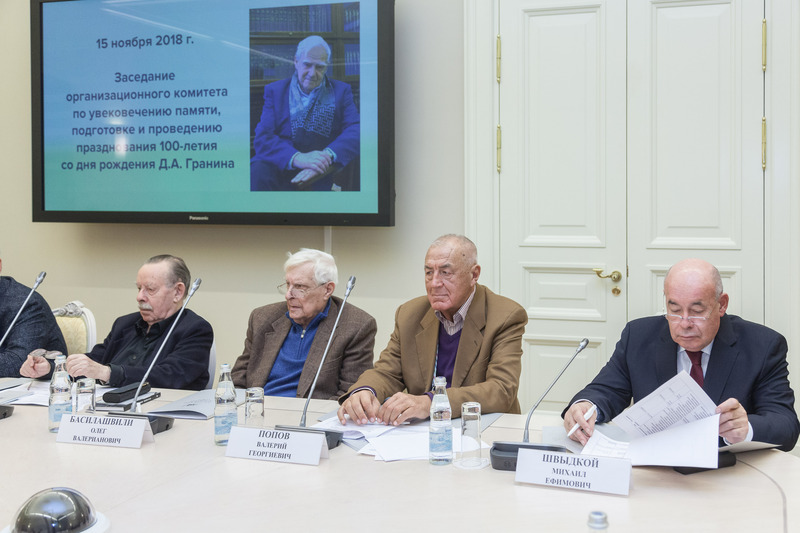 A major event in the framework of the events dedicated to the centenary anniversary of Daniil Granin will be the commemoration meeting of the writer at the St. Petersburg State Conservatory on February 9, 2019.